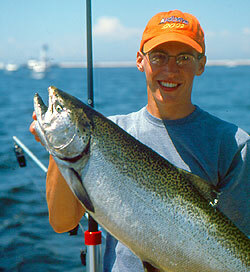 Here are some tips to help make your next Lake Michigan charter boat fishing trip a success. To begin, plan ahead and book your charter boat early in the season. This is very important as the summer fishing season is all too short and you don't want to miss your chance for your preferred charter date. July and August are very busy months, each with only a few weekend days available. If you have a specific time you would like to go, consider this: According to the charter association websites in January 2012, there are only 48 charter boats belonging to the Ludington Area Charter Boat Association and just 14 captains in the Manistee Charter Boat Association. 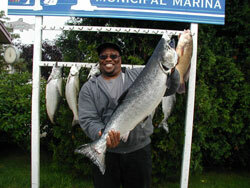 If you wait until the Lake Michigan fishing season is in full swing in August, you may be hard pressed to find a charter boat captain available for the date you want to fish. All the best charter boats and the best captains will be spoken for. So don't wait. 1) How many years have you been a captain? 2) What size charter boat do you have? 3) How many people will it accommodate? 4) Do you have a clean stand-up bathroom? 5) What will we catch? Fishing License - **REQUIRED** - with a trout stamp for all fishermen who have reached their 17th birthday. Daily licenses are available. Soft soled shoes - The deck can get wet and slippery. No black or dark colored soles - they make marks. Sunglasses and sunblock - SPF 45 if you're a "landlubber." Hat, Warm Jacket, Rain Gear - It's generally cool in the morning and believe it or not, it does rain occasionally. Food & Beverage - Check with your Captain regarding his policy on alcoholic beverages. Also your Captain may be able to provide food and beverage for an additional fee. Camera - To capture the magic moments and to prove you actually caught big fish. If you forget one, buy a disposal - they take great pictures. Cooler - to take home the catch. Your Captain will clean and bag your fish just the way you want them for the trip home. Nothing is better than fresh Michigan fish on the grill that very evening.